Tired of the lack of fun activities for Single people in Dumfries, a group of ladies have formed an alliance to help single people search for ‘the one’. With so many online dating websites and with not enough meet ups happening in Dumfries, they have decided to organise a Speed Dating Night this February. “We are hoping to provide a non-threatening environment for over 30’s Single people to come along, have fun and potentially end up with someone’s phone number at the end of the night! There will be a free drink on arrival – to calm those nerves; ice breaker games as well as a disco at the end of the night! Provided by Rab Smith. If all goes well, there will be more events to look forward to!” Sophie, Dumfries Singles Events Coordinator. 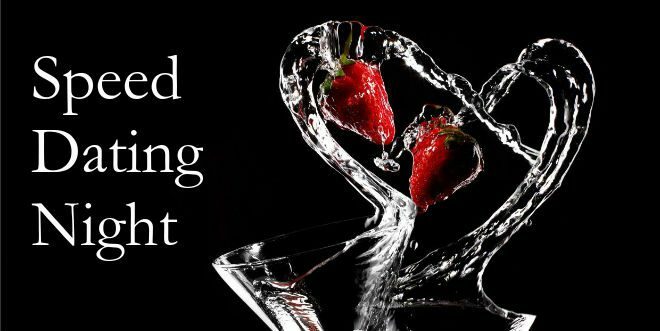 With people already buying their tickets well in advance, this event is expected to be a great night for all who venture out to see what cupid has in store for them. This event will have emphasis on ‘fun’ so make sure to get your friends to come along and mingle too. But do not fret if you are not successful this time round, Dumfries Singles Events will be hosting more events in the future. For a night of flirting, laughing and dancing, call our events coordinator to get your ticket. We will also be hosting a competition to win 2 tickets for you and a friend on our Facebook Event. 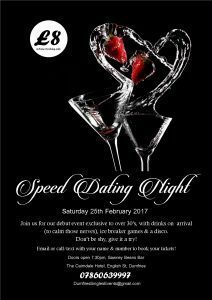 Just type in ‘Dumfries Singles Speed Dating Night’, join the event and look out for the chance to win! We look forward to seeing you there!